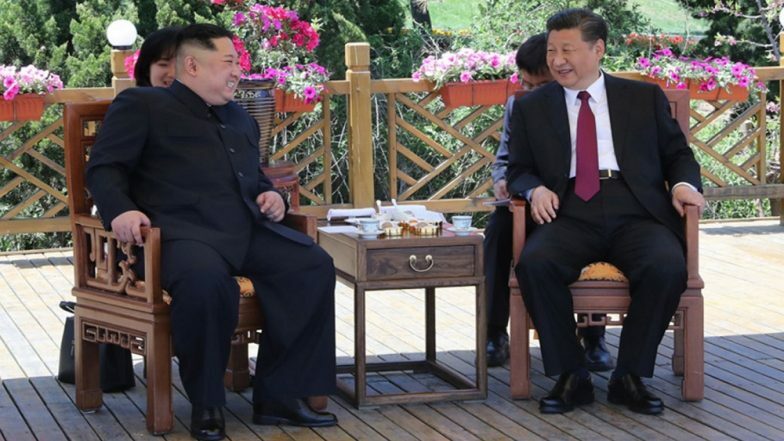 Beijing, April 10: A Chinese city has opened a new border crossing with North Korea -- fitted with radiation detectors -- even as talks between Washington and Pyongyang have languished over disagreements for nuclear sanctions relief. The new highway border crossing opened in the northeastern city of Ji'an on Monday, complementing its three existing ports with the North, the city said in a statement published to its website Tuesday. North Korea: Foreign Tourists Double in Pyongyang Marathon After Tension Eases, British Ambassador Tweets Colourful Pics of Event. "After three years of unremitting efforts, the China-North Korean Ji'an-Manpo Highway Port was officially opened," the city said. The project cost 280 million yuan ($42 million) and the city estimated 500,000 tons of goods and 200,000 people would cross through the new port each year. But crippling UN sanctions imposed on the North by the UN Security Council in 2016 and 2017 have crimped trade between the two Cold War-era allies. China is by far the North's biggest trading partner. While Pyongyang publishes virtually no economic statistics of its own, Chinese Customs figures show exports to China have plummeted by more than 90 percent since 2016, down to $213 million last year -- although some observers question their reliability Sanctions relief was top of North Korean leader Kim Jong Un's agenda for his Hanoi summit with US President Donald Trump in February. But the meeting broke up without a statement or even a lunch as the two sides disagreed over walking back Pyongyang's nuclear weapons programme in exchange for loosening sanctions. After the opening ceremony, the first 120 tourists crossed the border. Chinese tourism to the North has picked up as relations between the countries have improved in recent years. The crossing also has a nuclear radiation detection gate, the city said. China has long been worried about any fallout from North Korea's nuclear activities and Jilin was rocked by an earthquake after a massive bomb test across the border in September 2017. North Korea Says Move Towards Denuclearisation Only in Exchange for Partial Relief from Sanctions. The main artery for North Korean trade with China has traditionally been through the Chinese border city of Dandong, to the south. Ambitious city planners there started work on a Dandong New Zone in 2012, capped by a massive project to open a bridge connecting the city with the North Korean city of Sinuiju on the other side. Authorities expected billions of dollars in investment to flood into jointly-run free trade zones on both sides of the border. But after construction on the four-lane, $350-million bridge completed, it never opened, and the concrete runs into fields on the North Korean side.